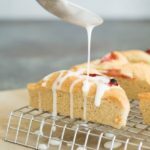 Dip into stews or soups, it is the perfect gluten free bread. I found a beautiful delicata squash at my local farmer’s market yesterday. Delicata squash is a sweet delicious squash that is delicious to use in baking! Just check out this recipe for Delicata Squash Brownies!! I was surprised to read that this variety of squash is as high in beta-carotene as other winter squashes. It is, however, a great source of fiber and potassium, making it a healthy addition to your cooking. 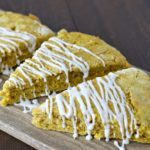 Delicata squash has such a mild, sweet flavor, and I suspected this vegetable would be incredible in a savory gluten free scone. 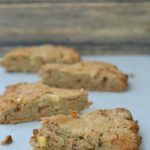 If you have been following my blog for a while, you know I love to hide vegetables in my baking. Up until recently, my kids have been none the wiser to this. As they get older, they seem to have special vegetable detection powers…much to my dismay. 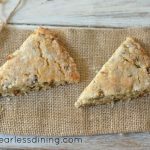 For this recipe, I decided to use organic cornmeal as the main flour in this gluten free cornmeal scone recipe. I worry about GMOs with corn so I make sure cornmeal is organic…It is worth it because the sweetness from the cornmeal blends beautifully with the delicata squash. Roast delicata squash with some olive oil in the oven. Sauté delicata squash in a pan with olive oil. If you are in a hurry, you can also cook delicata squash in a microwave by cutting the squash in half. Remove the seeds and place face down on a microwave-safe dish. Add a little water and microwave for 5-8 minutes. Delicata squash cook up very easily in just a little bit of olive oil. Once they are tender, they can be used in lots of different recipes. I love to eat sauteed delicata squash! 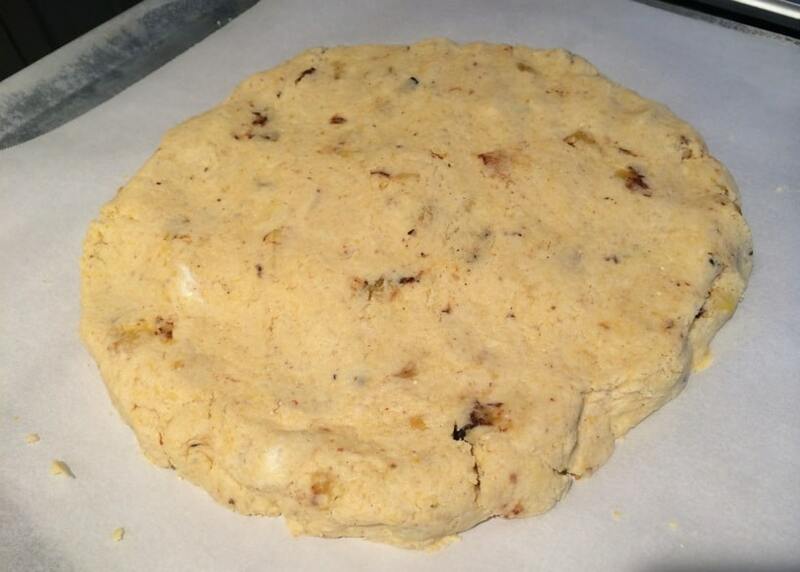 The delicata squash mixes well into the gluten free scone dough. Put a piece of parchment paper onto a baking sheet and press the dough into a round shape. Cut the raw dough into wedges and bake. In a frying pan, heat up olive oil on medium heat. 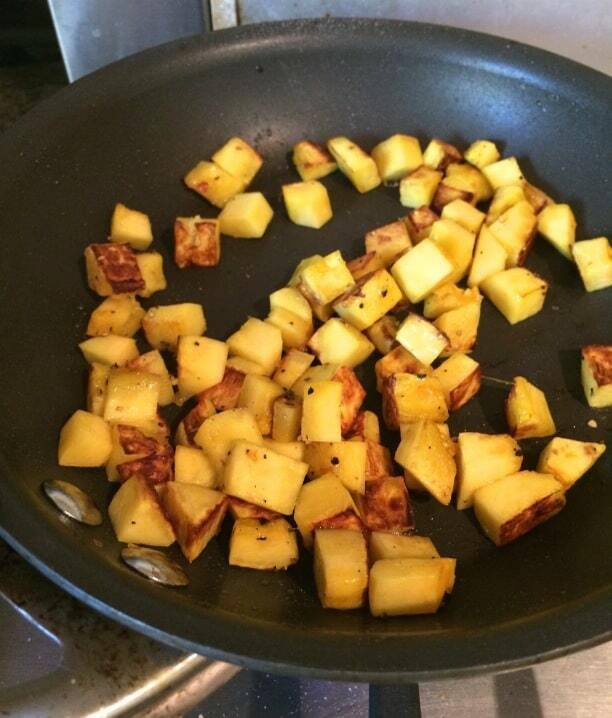 Cook cubed delicata squash until tender. In a large bowl add cornmeal and gluten free flour. Whisk in all other dry ingredients to blend. 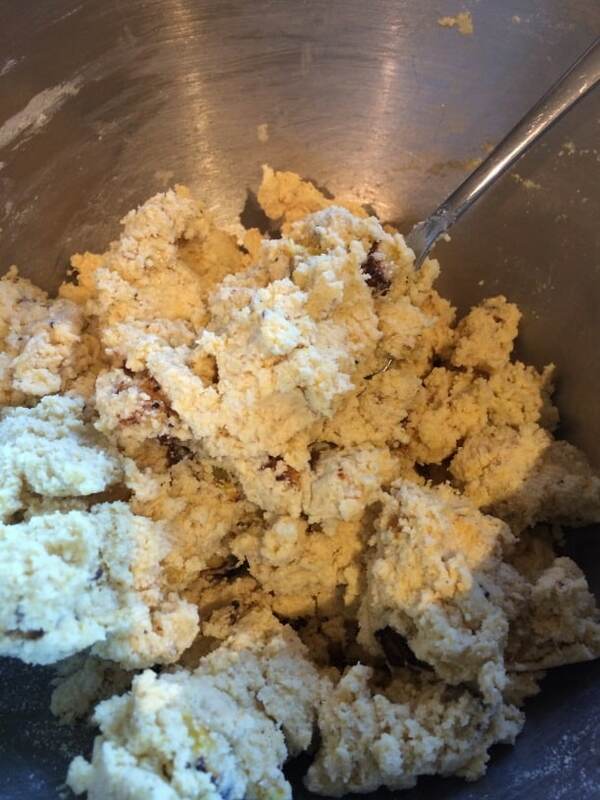 Add cold butter and use a pastry blender to cut butter into the dough. Add squash and wet ingredients. Put a piece of parchment paper down on a baking sheet. Make 8 cuts, similar to a pizza. If dough sticks to the knife, wipe off before making the next cut. Bake for 20-25 minutes until done. I may have to make this for my mom the next time she visits. She would love it. 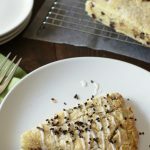 This would be great for a breakfast treat if made the day before. Just warm them up a bit and serve. can you swap and use a different squash, like pumpkin? this is such a unique flavor combo! it sounds totally delicious! yum-o!